Who doesn’t have fond memories of the View-Master? The stereoscopic toy allowed us all to step into an episode of Scooby-Doo or take a trip to the Grand Canyon without ever leaving home. 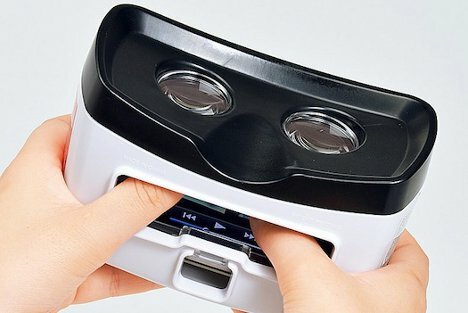 The modern high-tech version of the View-Master is this streamlined gadget from Japanese gadget maker Sanwa. The white plastic gadget uses an iPhone rather than a paper and plastic wheel to transport you somewhere fantastic. 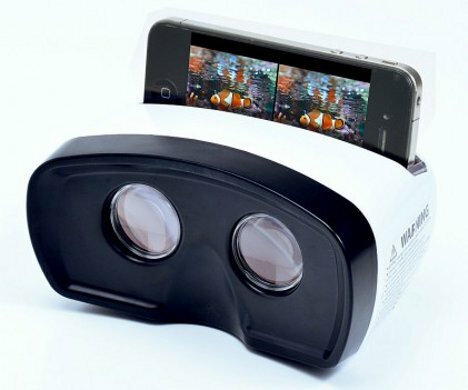 The device was meant to be used with YouTube’s 3D channel. But unlike traditional 3D viewing which requires red and green glasses, Sanwa’s invention uses stereoscopic video – two versions of the video set side-by-side – to create the 3D effect. See more in Camera & Video or under Gadgets. July, 2012.